Aiming to educate air passengers about the structures and topography they spot out their windows during flights over North America, Dicum, who chronicled the coffee industry in 1999's Coffee Book, also entertains. Instead of organizing the book by well-traveled routes (New York to L.A., for example), he divides America and Canada into regions (the Great Plains, the Mid-Atlantic) and describes the landforms, water formations and human features endemic to each area, with sidebars on how to spot such entities as urban sprawl, interstate highways and federal land ... In an easy, cogent style, Dicum answers questions curious flyers may have wondered but never understood, like why some farmland is arranged in squares and some in perfect circles ... Compulsively readable, the guidebook is composed of both handy factual information as well as deeper lessons about North America and its inhabitants. 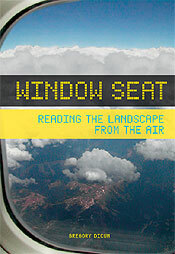 If you are a window-seat kind of person, Dicum's small new book, "Window Seat -- Reading the Landscape from the Air" is a godsend. It explains how to decipher the mishmash of dots and blobs and unidentifiable weird things you see out the window while flying over the United States and Canada. ... maybe we need to do what [Dicum] says -- look out the window once in a while and remind ourselves of the delicacy and majesty of this world, the poignant and puny human attempts to improve it, and regain some kind of "gee, whiz!" feeling when we fly. 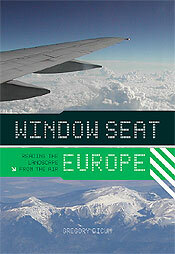 Overriding current anxieties of commercial flying, Dicum celebrates the joys available by choosing the window seat. "The food might be utilitarian, the seat cramped, and your neighbor annoying," Dicum writes. "But the sheer pleasure of contemplating our planet from 35,000 feet (about 6.5 mi., or 10.7 km) in the air is worth any price. A century ago, nobody on Earth could have hoped to see this view." The book contains 70 aerial photos of various landmarks, all in North America. It guides readers though common curiosities seen from the air including: pivot irrigation circles (which are not, as it turns out, created by UFOs), the Northern Lights and feather-like drainage patterns in the high plains. Photos were taken by a satellite - not from an airplane - but are glorious. My favorites include the icy barrens in the Arctic Circle, a bucolic farmland next to the Chesapeake Bay, and, for some reason, a shot of the country's largest tire dump (40 million tires near New Haven, Conn). Bound to provide considerably more entertainment than the in-flight movie.